Your heart pumps blood through the vessels called arteries. The large arteries leaving the heart end into smaller arteries called arterioles. These arterioles end into still smaller vessels called capillaries, which supply oxygen and nutrients to all the organs of the body. The blood finally returns to the heart through the veins. Certain nerve impulses cause the arteries to dilate (become larger) or contract (become smaller). If these vessels are wide open, blood can flow through easily. If they’re narrow, it’s harder for the blood to flow through them and this results in increased blood pressure. This leads to increased workload on the heart and the arteries. 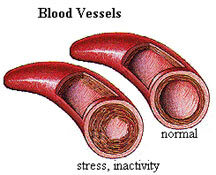 If high blood pressure persists the heart gets stressed and the arteries are damaged. These changes in the vessels can also affect the other vital organs like brain, kidneys, eyes.